I love the game, we had a great time playing it fast easy playing game. You can play it almost everywhere, especially in parks and on the beach. My family loved it so much, that we purchased 2 more sets. So many things I love about this toy. Foremost, it gets the whole family together for some healthy outdoor fun. We absolutely love your game and tell everyone we know that they have to own these! I don't know how long I can last not getting to play! I bought this for my grandsons 7th birthday. He loved it, as well as his Dad and little brother. Cool toy. 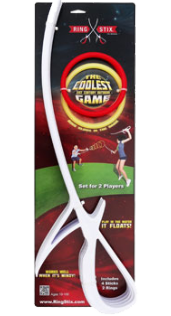 Easy to learn and fun to play doubles or in large groups. If you are looking for an alternative game to add to your beach or park play kit, I highly recommend RingStix! winning toy, never fails to make people stop and watch. 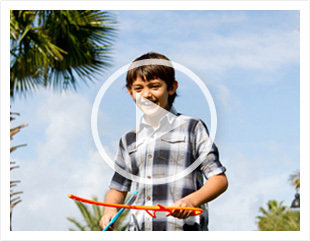 RingStix is a fast and easily learned outdoor activity for ages 6 and up and will get the whole family up and moving. 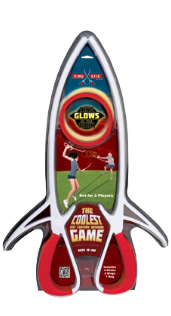 Play RingStix with two players, in a group or solo. It is quickly becoming the new favorite at gatherings, reunions, vacations, etc. 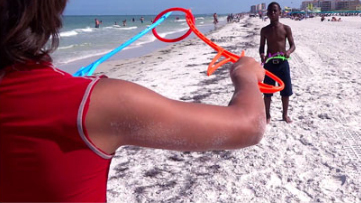 The sticks and ring float so you can have fun playing Ringstix at the beach. The ring even flies through the air in heavy winds! 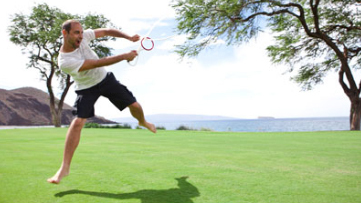 RingStix is unique in that you can be as active as you want - run around and play long distances up to 30-50 yards or pass the ring around leisurely at short distances and have a conversation as you play. Physical education programs in schools have already started using Ringstix to keep their students active and healthy. This interactive toy, which uses sticks to quickly catch and launch the ring, is simple enough for anyone to learn, yet intriguing enough for all ages to enjoy. Each player holds two sticks which he uses to propel the ring spinning forward toward the other player. 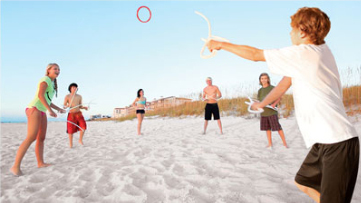 The catching player then uses the end of one or both of the sticks to catch the flying ring. This repeats back and forth while spinning, leaping and laughing. Families can invent their own way of playing, keep score and do tricks - it's a new game every time! Even dogs have fun and love to chase and retrieve the rings! Each set is A FULL SET FOR TWO PLAYERS, starting at $14.99. Our goal is to promote healthy exercise that also builds hand-eye coordination while having a blast! What makes RingStix unique is that it strives to capture, in all of us, our innate creativity and playfulness. 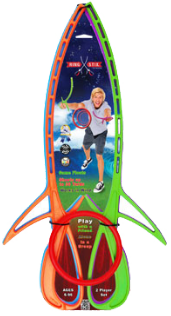 RingStix brings generations together, is easy to learn, is fun and creative and gets you moving as you socially interact. Children, who don't like to move around a lot, will appreciate RingStix just as much, because the ring does not roll away and is easy to pick up.